This Valley tradition returns for a fifth year on April 29 at 7 PM at the Academy of Music Theatre! Come celebrate our collective hometowns here in Western MA as we laugh about and love our LIFE IN THE (413)! 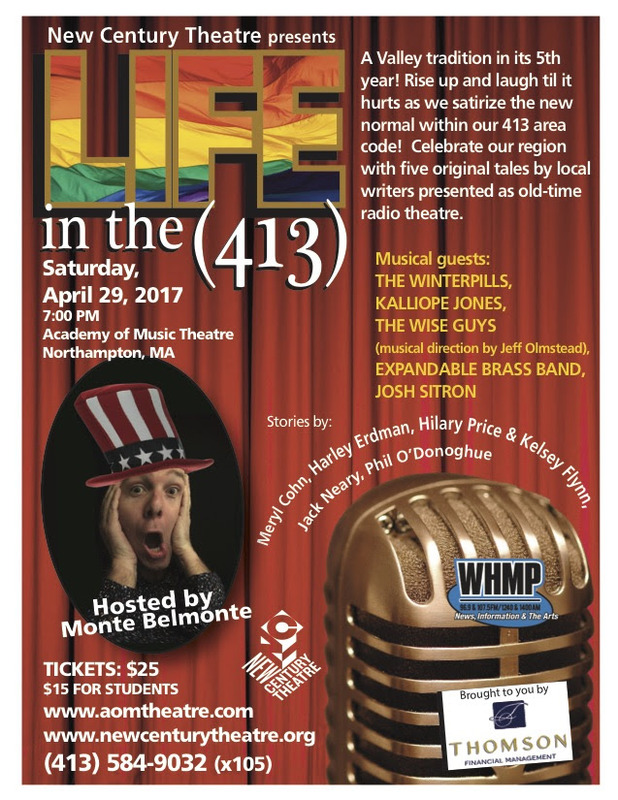 Saturday, April 29 at 7 PM, New Century Theatre and WHMP are teaming up once again to present LIFE IN THE (413), a rollicking, celebratory night of original radio plays that lampoon life in the Pioneer Valley. Five short radio plays - each featuring a different locale - will feature a range of Valley performers. The event helps to kick off New Century Theatre's 27th summer season at Pioneer Valley Performing Arts Charter High School in South Hadley and the Academy of Music Theatre in Northampton. 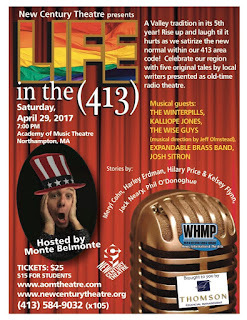 This year's Emcee, WHMP radio host Monte Belmonte, will welcome five playwrights to the Academy of Music stage, including New Century Theatre co-founder Jack Neary, local playwrights Phil O'Donoghue, Harley Erdman, MerylCohn and the writing team of Hilary Price and Kelsey Flynn. The show, now in its fifth year, will also feature teen girl rock band Kalliope Jones and special guests Philip Price and Flora Reed from the indie rock band THE WINTERPILLS. The Washington Post calls The Winterpills "fiendishly melodic." Also returning will be the the raucous and joyful sounds of THE EXPANDABLE BRASS BAND. The fabulous all-male a cappella group THE WISE GUYS with musical direction by Jeff Olmstedwill be making their LIFE IN THE (413) debut. Acclaimed composer and performer Josh Sitron, whose work had appeared on the television shows "Dora the Explorer" and "Allen Gregory" will also be on hand to lend some music stylings some some of the featured radio plays. The evening wouldn't be complete without the amazing live foley FX team of New Century Producing Director Sam Rush and actor Frank Aronson. Tickets are $25 general, $15 students, including all Academy of Music service fees. Curtain time is 7:00 PM and tickets can be bought online at the link below. Click here to purchase tickets to this event!